Step 1. You will need an empty turtle shell and a length of dowel or stick for the handle long enough for the shell, a short tail, neck and head. 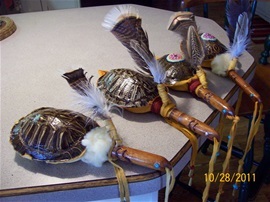 Also prepare several buckskin cords for tying the shell to the handle, pieces of buckskin to be glued to cover the shell openings, feathers, and metal cones, beads for eyes and decorations, and small round stones or bee bee shot for sound. Step 2. Hand carving knives will work, but I prefer a sanding tool and moto drill. Yes, I know they are not traditional, but if we had them then we would have used those electric tools. Step 3. Using a belt sander or knife, carve the dowel or stick flat from the length of the turtle shell to the tail end. Form the tail into a sharp point. The thickness of this length of the dowel/stick should be thin enough to go through the front opening of the shell all the way out the backend opening. Carve the turtle head with its beak and make two rings around the neck of the turtle like ridges as would be on a turtle neck. Make eye indentations on either side of the head about half as deep as the bead you will use for eyes. Step 4. Drill a 3/16 inch hole in the tail under the shell on the dowel/stick and one in the neck under the shell just behind where the dowel/stick exits the front. Drill two holes in the turtle shell to match each of the holes in the dowel/stick. These holes are to be threaded with the buckskin thin laces to keep the dowel/stick attached to the shell. Step 5. Lace and tie the shell to the dowel/stick. Step 6. Cut and fit a piece of buckskin to cover the holes at each end and hot glue the pieces to the underside of the turtle covering the hole at the back. Leave one side of the hole in the front open so you can place small round stones or bee bee shot into the shell for sound. Step7. Place the stones/shot into the shell and glue the remaining front corner opening shut. Step 8. Drill a hole in the turtle head below the eye and thread a buckskin cord through it to be used as a wrist band to hold the shell shaker. Beads and cones can be threaded on to the ends of this wrist holder. Step 9. Make a feather for the shell. Now hot glue the feather to a small piece of buckskin. Put a buckskin cord across the feather tip and fold the buckskin piece back over it and glue. Wrap the end of the feather beam on the folded piece of buckskin with another buckskin cord and glue it shut. Tie the feather at the front of the shell around the turtle neck dowel/stick. Step 10. Glue in the turtle bead eyes and a beaded rosette on the back for decoration as an option. Congratulations! You have made your first Lenape Turtle Shell Rattle. RARAFRF, are you interested in purchasing one of the rattles? It is a great gift to give, your knowledge that is. You taught me how to make moccasins as meager of an attempt it is.